2/12/09 Happy birthday to 2 great historical figures. Darwin and Lincoln! They both would be 200 years old if they were alive. 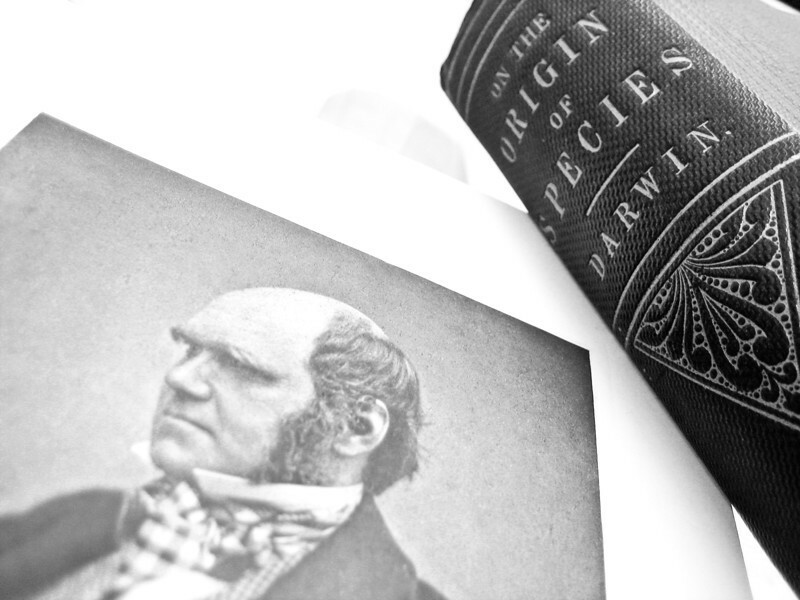 Here is a portrait of Darwin with a first edition of On The Origin Of Species, published in 1859! In case you're curious how I got access to something like that, I work in a library that owns many rare books and it was on display today in honor of Darwin's 200th birthday. Very cool! UPDATE: I modified the caption - I originally thought that Lincoln was born in a different year, oops! Here, here, and the knowledge of stratigraphy and early man that went with the reasoning behind the Origin of Species. When the intelligent design vs evolution debate hit town a few years ago, I asked an archaeology professor, who was also a deacon in the 7th Day Adventist Church, what he thought. He said, "I think it indicates that we have done a very poor job of teaching people what science is." Nice composition. No matter what you think of the theory of evolution by natural selection, you have to admire his sideboards! Nice composition and very timely! very nice comp......hate to tell you but Lincoln would have been 200 years old yesterday as well.